Kirby: Triple Deluxe launches in Japan on 11th January, just a few weeks from now, but today's Nintendo Direct broadcasts didn't narrow down the Western release any more than '2014'. Nevertheless, we did get to see a lot more of the game in action and learned of some additional mini-games that will be featured. 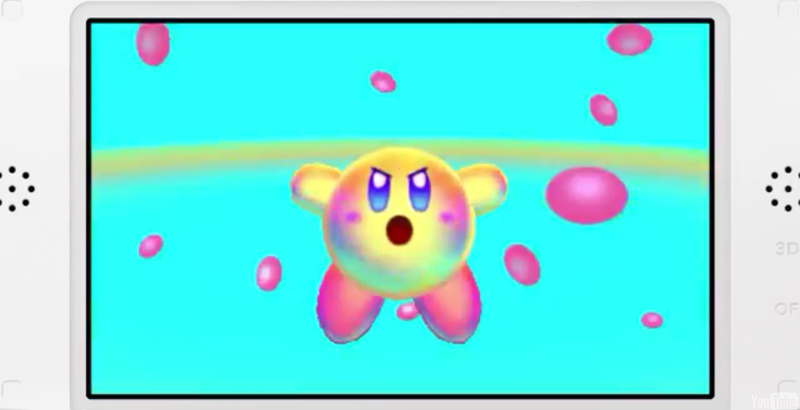 First of all Satoru Iwata showed footage of the main game in action, emphasizing the ability of Kirby to jump into the background and foreground at various points, which should look rather attractive on the autostereoscopic 3DS screen. There were some fun moments, such as a tree falling to destroy a platform in the background, and a train zooming forward towards our here in the foreground. It was highlighted that it'll feature 20 different copy abilities including four that are new to this title, with the Bells looking like a means of stunning enemies; the Hypernova ability, meanwhile, with power up the pink one so that he can cause dramatic damage. Also shown were two mini-games that will feature. First up is Kirby Fighters, a four-player brawl where each character is powered up with one of 10 copy abilities, touted as a way of deciding once and for all which abilities are the most powerful. Then there's Dedede’s Drum Dash, which is a rhythm-based game that tasks you with collecting points while keeping up with popular tracks from the series. It certainly looked charming and fun. Once Nintendo releases official footage we'll add it below; in the meantime, what did you think of the Triple Deluxe showing in today's Nintendo Direct? Is it a true, multiplayer Vs. Mode? 'Cause that sounds beyond awesome. Kirby Fighters looks like Brawl, which means I will be picking this up. Triple Deluxe is getting more attractive with each new video. Dedede's mini-game sounds pretty good to me. In fact, I'd like to see games starring Nintendo villains. Like King Dedede's Dream Land. Or a Bowser game, they almost did it with Bowser's Inside Story... to be fair, I'd be happy with a new Wario Land. 2014 gives me the impression it will launch in autumn, six months after the Japanese release, for absolutely no reason. Love rhythm games, and the Kirby Anniversary Edition showed me how good Kirby music is. So I loved the Dedede minigame. More Kirby game is a welcome, a new Kirby game for Wii U would be very appreciated too. Kirby Fighters indeed looks like a simplified Super Smash Bros, it might be fun! I hope the main game has better collectables/unlockables than Wii's Kirby's Return To Dreamland. That 120 sphere engines unlocked nothing worthy. I rather we have treasure chests back. The more Kirby the better, I always say. Well, I'm even more excited for the game after that! Kirby Fighters itself looks like a fun game. Over 20 abilities, including new ways to use some classics... Sounds good. @rafaelluik Kirby Fighters may be a dumbed down Smash Bros, but it's a great deal for a Kirby game. I hope that it's better, too. Kirby's Yarn was a disgrace to Kirby. "2014" wow thanks Captain Obvious. Iwata... Fooling fans since always. This is the perfection of the 3ds. Wii U needs to take a page, but after today, it looks like the wii u might start being good. @Williaint aww, I liked epic yarn a lot. I thought it was really charming. @ luke88 It really didn't need Kirby. It could have been prince fluff and some other character and been just as charming. This went from a maybe to a day one after the direct. Go Kirby, Wit ya bad self! The is genuinely one of thee best ALL-ROUND looking games coming from Nintendo in the near future. On both it's platforms (and I don't just mean in terms of graphics). Even just the Brawl style mini-game alone looks brilliant and that's just a bonus mode. I just wish Iwata was making all his other teams put as much love, attention and polish into all Nintendo's other games, like the the New Super Mario Bros games for example, as he's obviously checking and making sure they put into every aspect of these last few Kirby games. This looks great I may have to break down and buy another 3ds. So getting this day one. Kirby is my favorite Nintendo character next to Mario & Luigi and Donkey Kong. Really hoping that the European of Kirby 3DS is not that long after the Japanese release. This and Yoshi's Island 3 will bring so much joy to the dark winter. @rafaelluik Yeah, best Kirby minigame ever. Of course, it's similarity to Smash Bros. isn't surprising considering who's in charge of the Kirby series. How long does it take to translate a Kirby game and put angry eyes on the cover? How long can that possibly take?